The first member of the Powlton family to immigrate to Australia was my grandfather John Powlton who was a boiler attendant and steam engine driver. He was sponsored by Kinnears Rope Mill in Foootscray where he met my grandmother Annie Josephine Lamprell. Nan was born to Irish parents in 1899 at Lyell,on the west coast of Tasmania, Australia and they were married at Footscay in 1921. Their oldest child Evelyn Mary was born in 1924, my father John James more commonly known as Black Jack was born in the family home in Footscray on the 25th of February 1929. With 3 John's in the house it could have been very confusing so we each had a nickname, Pop was called Jock, Dad was always called Jack and I was always refered to as John H. or John Hilland. My mothers maiden name was Alison Jean McCoid, she was born at the Womans Hospital Carlton in 1933. Her mother Effie Jean Snaddon was born in Australia to parents of scottish decent. Grandma was the only grandparent I never met, she died young while my mother was still a teenager. Mums father Peter Hilland McCoid lived with us when I was young and I still remember him well. After working on the docks as a stovadore he became a trades assistant until throat cancer affected his health and eventually killed him around the age of 50. Mum had 4 brothers and 2 sisters with 4 still alive today. James William McCoid died as a young child on a tram travelling to hospital, Peter McCoid died of throat cancer at a similar age to his father and my mother died of cancer in 1995. The earliest Powlton I can locate known to be a member of my family is W. Powlton, a clockmaker from Lancaster in England. 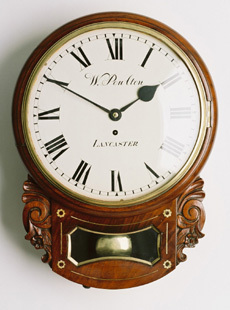 The image above is of a clock with brass inlays he manufactured C.1840, it is a display of first class craftsmanship. My grandmother always said that my great great grandfather was a reputable English clockmaker who built many large clocks around London. This is the only information I have, if anyone can shed some more light on my families history please submit the information on my weblog. 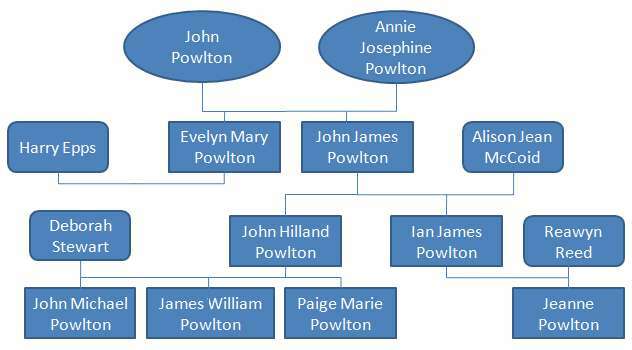 The Powlton Family in Australia today comprises of my brother, myself and our respective families but we have many relatives with surnames from marriage including Epps, Mawby, Clark, White, Steel, and many more. The newest addition to the Powlton family was born in Queensland to my son James in October 2008. Amelia Marie Powlton.